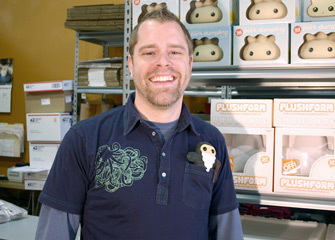 Best known as the creative force and plush mastermind behind Shawnimals and Ninjatown, Shawn Smith started his company before he even knew it by watching cartoons, drawing pictures and playing video games as a kid. Fast forward to a job at EGM magazine as a game reviewer, Shawn decided to leave and focus on his first love: Art. While Back to School like Rodney Dangerfield, he wondered what to do with the countless sketchbooks on his shelf, filled with hundreds of unused characters. Shawnimals were born shortly after from Shawn’s pop culturally-inspired aesthetic: Simple, compelling character designs, strong narratives, and a healthy dose of humor. With partner and wife Jen Brody and its talented staff, Chicago-based Shawnimals has grown quickly from its humble beginnings, now with a Nintendo DS game based on its Ninjatown brand, a number of plush and vinyl toys, and so much more.